Living in the era of peek TV, there’s a tremendous amount of pressure on Networks to come up with shows that wow. With so many options available to a viewer, no matter how well promoted a show is, tremendous cast or writing, if a viewer isn’t hooked by the end of the first episode, they can simply discard the show, forget all about its existence and move onto the next show sitting in their queue. There is a lot of pressure on ‘Killing Eve’. Sandra Oh is the star name. It’s been renewed for a 2nd season before this first one has even aired. Its had a tremendous amount of publicity, and a lot of hype, and thankfully the show absolutely delivers. I’ve had the pleasure of watching quite a few episodes of Killing Eve, and they’re all a tremendous piece of television, starting of course with episode one titled ‘Nice Face’. The way that this episode opens is intriguing. There’s no grand introduction to the characters and a mountain of exposition. Our villain is just in an ice cream parlour, watching a young girl eating ice cream and on leaving, she knocks the girls ice cream into her lap. Not a word of dialogue is spoken and justifiably so, because when you have an actress of Jodie Comer’s calibre playing your antagonist, you don’t need it. Jodie Comer is somewhat of a rising star in British television. She broke out in E4’s dramedy ‘My Mat Fat Diary’ and since then has been in ‘Dr Foster’ & the magnificent ‘Thirteen’, which I would strongly advise anyone who wants a taste of just what exactly Jodie can do to watch. In Killing Eve she stars as Villanelle. She’s a highly skilled assassin, easily able to adapt to any environment and extremely playful. The last two qualities are surprisingly enough more dangerous than her abilities as an assassin because it’s impossible to see her coming. Something that Eve learnt at the end of the first episode, when she was completely unaware to the fact she was actually in Villanelle’s presence. 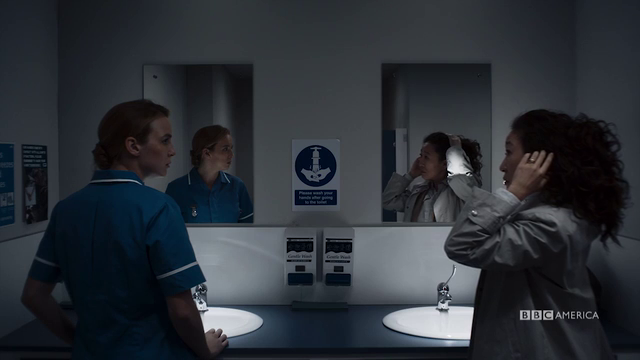 They’re in a hospital toilet, Eve is trying to work out what to do with her hair, in a nurse’s uniform Villanelle gives her some nice friendly advice. Eve takes it on board and then returns to the hospital bed to find a massacre awaiting her. The show has a lot of humour, in some places quite dark, that might seem a bit alien to an American audience. 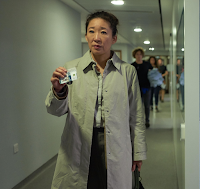 I know from some of the previews I’ve read people have commented on how it seems a little mismatched, and Sandra Oh doesn’t exactly seem comfortable with it but I completely disagree. 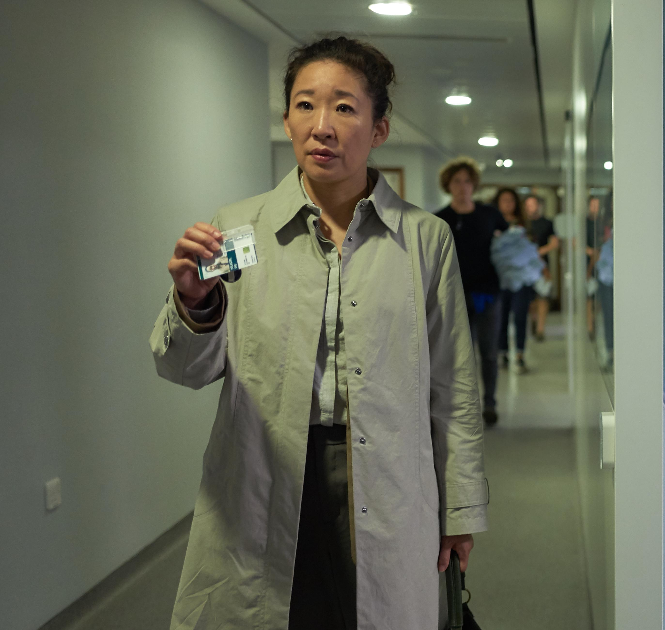 Sandra Oh’s character Eve Polastri yearns to be a spy, dealing with high octane cases but is instead stuck behind a desk. She gets dragged into the Villanelle mystery partly by luck and also because she refuses to give up. Her peers around her may look down on her attitude as that of someone who is desperately trying to be something she’s not, but Eve is onto something here. She can see a pattern with the murders that are happening, she can feel there’s something linking them, and she’s one of the first to realize the killer they’re looking for is a woman. 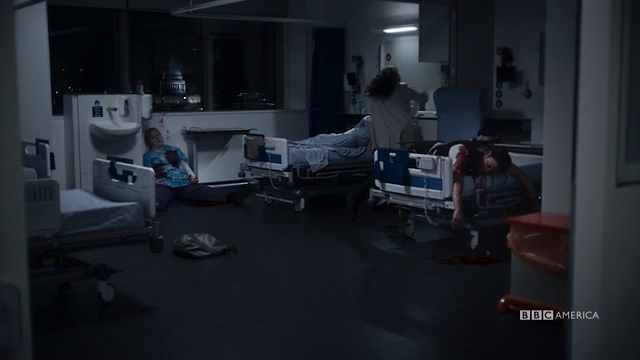 After the massacre at the hospital her boss Frank sees the perfect opportunity to get rid of Eve and seizes it with both arms. 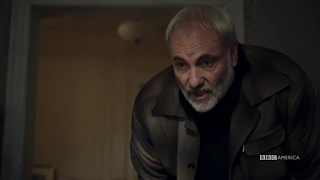 He fires her, not only laying the blame for the whole situation at her door, but also making her feel personally responsible for people dying. It’s a bit of a douche move which Eve greets appropriately, but all isn’t lost as Carolyn Martens seeks Eve out. She agrees that Eve is into something here, and she wants to give her the resources to investigate, off the books of course. Away from Eve investigating her, Villanelle doesn’t have it all her own way. She has a handler named Konstantin who is extremely well aware of her temperament. In places he goes along with it, enjoying the fun and games just as much as her, but then he can be serious and come down on her like a ton of bricks. 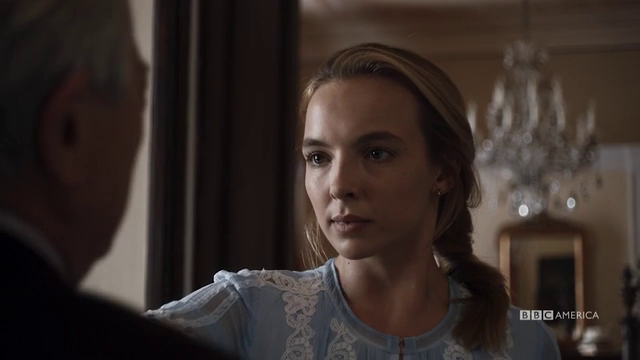 Villanelle is in places too confident in her abilities, bordering on cocky. That makes her slightly sloppy, and a slightly sloppy assassin is obviously not a good assassin, especially when people are beginning to become aware of your presence and investigate you. There isn’t much backstory on Konstantin in this opening episode, which is another unique thing about this show. Usually in a premiere it’s all about building up the characters, stories, setting up motivation and of course backstory. After all we need to understand to an extent what exactly drives the characters to do what they do. 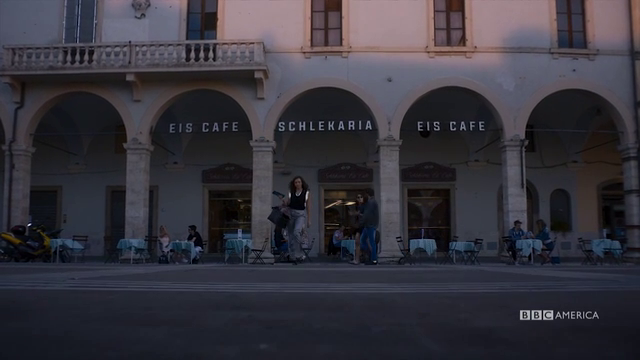 Killing Eve completely throws the rule book out the window. From the second ‘Nice Face’ begins, we’re thrown straight into the story. We get just about enough information on characters names and those around them to be able to know how to refer to them, but that aside the focus is completely on the cat & mouse game. Eve and Villanelle both know that each other exists and is out there, and we’re just along for the ride.